The game was missing some of its biggest stars. The play on the ice for much of the night was ragged. The two best players on the ice were the two goalies. Still, two points were on the line between a Washington Capitals team that has struggled all season to find an identity and a Pittsburgh Penguins team that is wounded to its very core. After a lackluster and sloppy 55 minutes that featured more turnovers and missed entry passes than highlights — for either team, the homestanding Caps held on at the end for a 1-0 win, leapfrogging their arch-rivals to gain eighth place in the Eastern Conference. Jason Chimera beat Marc-Andre Fleury on a breakaway at 15:25 of the first period for the game’s only goal. Fleury (20 saves) and Caps netminder Tomas Vokoun were the two stars of this one, with both goalies trading save after great save at either end. Vokoun might have played his best game of the season, consistently and confidently pushing pucks aside or quashing them altogether. He saved all 30 shots against, including several in the last five minutes after the Pens killed a late penalty to gain momentum back in their favor. The shutout was Vokoun’s 46th of his career, tying the legendary Ken Dryden for 26th all-time in the NHL. The win kicks off a four-game homestand in perfect fashion. No hockey player likes to look forward too far, preferring to concentrate on the game at hand. But the Caps know that with Pittsburgh (eighth in the conference), Tampa Bay (13th), Carolina (15th) and the New York Islanders (14th) visiting Verizon Center in succession, now is the time to string some wins together and get on a roll as they head into the second half of the season. The Caps are two completely different teams whether they’re home or away. 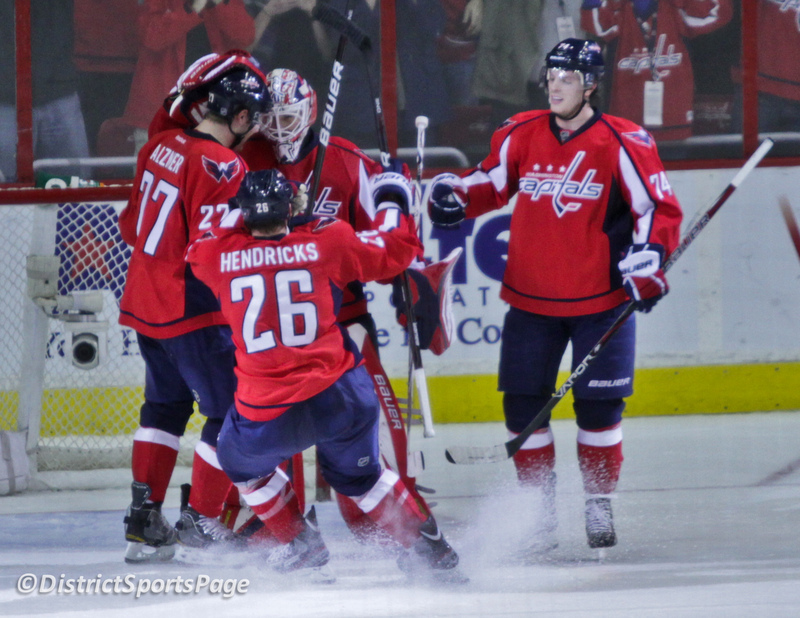 After last night’s win, the Caps are 15-5-1 at Verizon Center, a 121-point pace. On the road it’s a different story. Their 7-12-1 record translates to a dismal 61.5 point pace. The fine folks at Japers Rink Wednesday posted the glaring numbers; they’ve got the league’s best home power play and second best penalty kill. On the road? Try 25th and 27th. That makes this homestand vitally important. The team has talked about wanting to get on a roll and gain momentum in the standings and this is the perfect time to do so. The Penguins came in here banged up beyond belief and the Caps handed them their sixth straight loss. Tampa Bay, Carolina and the Islanders are the only teams in the East with fewer road wins than the Caps. The time is now. That lack of success is evident, which makes dominating at home that much more meaningful. Until the Caps can figure out what causes them to play so poorly when they travel, they must take every opportunity to accumulate points, especially against teams below them in the standings. The Caps win 56 percent of the draws, blocked 21 shots and registered 39 hits. They have not surrendered a power play goal in their last 10 home games (26 attempts). Jeff Halpern and Joel Ward assisted on Chimera’s goal. The play started when Ward poke-checked Evgeni Malkin at the Caps blue line when the Pittsburgh forward dangled for too long, leaving his defensemen out to dry and out of position, causing the odd-man rush back the other way.